The Atrium C-Qur mesh is used in surgeries involving hernia repair, chest wall repair and surgical wound repair. 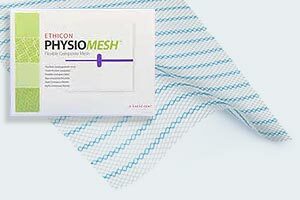 Physiomesh, manufactured by Ethicon (a Johnson & Johnson subsidiary), is used in laparoscopic surgery to repair hernias, or tissue breakthrough, in the abdomen wall. A CNN Medical Producer recently noted that most of the medical devices recalled between 2005 and 2009 did not go through the FDA’s PMA program but were cleared through the less rigid 510(K) Premarket Notification program. Link here. PMA is a result of the 1976 Medical Device Amendments, which were added to the FDA’s Food, Drug, and Cosmetic Act. To have a device approved, the applicant or manufacturer supplies the FDA with a “full statement” of what the device entails, including packing, manufacturing, and processing. The FDA also requires samples of device components and a sample of the proposed labeling. The 510(K) process allows a device manufacturer to bypass the thorough PMA process if the proposed device is substantially equivalent to another product that was approved through the FDA’s PMA. This, in essence, allows the product to be used on patients without any trials or testing based solely on the fact that it is similar to another approved product. Both composite 510(K)-approved mesh devices, Atrium C-Qur and Ethicon Physiome sh, are made of synthetic resin called polypropylene. Synthetic mesh has become more common in hernia and tissue repair, as sutures are more likely to lead to infection, pain, and a slower recovery. However, both are causing an increase in hernia recurrence, requiring further surgery. This completely defeats the purpose of mesh being safer, as many patients are facing additional surgery, missed work, and an increase in medical costs. Patients who have been treated with either of these mesh devices may experience abdominal pain, bowel adhesions, infections, ulcers or perforations, mesh failure, and require revision surgery. If you or someone you know has had complications related to surgical mesh for ventral hernia repair, chest wall repair or surgical wound repair, please know the skilled attorneys at Hollis, Wright, Clay and Vail, P.C. are able to assist you in securing the compensation to which you may be entitled. Hollis Wright also handles claims for a host of other medical devices, including problems that arise due to hip replacement surgery. You may call us for a free and confidential consultation at 1-844-LAW-TALK or 205-324-3600.